I posted this on Monochromia a few days ago, though it occurred to me today that it was a perfect entry for Signs: the WordPress weekly photo challenge. Though the challenge ended a few days ago, better late than never. Still test driving my friend’s Nikon D7000, I couldn’t resist putting the camera through its paces when I walked by my local movie theater late one weekday evening. I was drawn to the nearly deserted lobby, and of course, all the lines, curves, and shadows and the brightly lit signs. I loved the possibilities this scene held for a black and white conversion. The result? More love for the D7000! This entry was posted in Black & White, Monochromia, Photo Challenges and tagged black and white, photography, postaday, signs, weekly photo challenge. Bookmark the permalink. 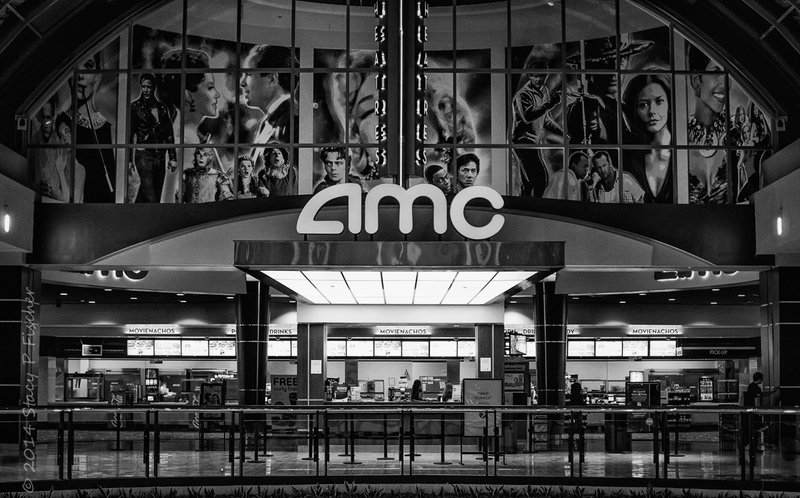 great photo for black and white, I love the two levels as well – the lines and glass, as well as the beautiful black and white images of famous movie stars, pefect for the movie theatre! Love the shot and the B&W is absolutely perfect. Well done. Thanks, Tina. I appreciate your comment! That is a superb view and shot! I love how you captured the movie posters in the background. It reminds me of living in the Philippines. All around the city huge movie posters featuring popular entertainers from their country and other parts of Asia and Europe. Thanks for sharing. Hi Stacy! I’ve not made it over to Monochromia yet today so I’m glad I’m seeing this here. So much to see in this image! Nicely done!